Best friends, boys, sleepovers and pool parties...that's what life is rumored to include when you're in middle school and you're heading into summer vacation. But, for Annabelle there is a five-mile-radius-rule. She makes sure everyone she knows stays at least five miles away from her house and the life she lives there. What could be so wrong that you need to keep everyone that far away? What awful secrets are you keeping there? So imagine you are sitting in your kitchen one morning eating your Cocoa Krispies and watching the milk turn that beautiful brown color that means it's gone all chocolate on you. Across the table your younger sister, Leslie, is sitting there eating her cereal and Dad is reading the newspaper. When suddenly, your older brother, Chad, slams his way out the door and the tower of newspapers growing out of the floor on its way to the ceiling comes crashing down smashing onto your sister and scattering dust and potential disease in every direction? Imagine if that isn't the only tower of newspapers there and your mother comes racing in to the kitchen shouting, "Which stack was it, " instead of, "Is everyone okay?" Old milk cartons and egg cartons are stacked up on top of the cabinets and more and more and more stuff lines hallways and bedrooms and the door to the dining room is locked and holding some mystery behind it. What if your mother is a hoader? What if you feel like there is no room to breathe in your house and you have to fight to claim your own bedroom? That's the world Annabelle is hiding from her friends. That's the world that is slowly smothering Annabelle and Leslie who has nightmares and has put together a file on hoarders endangering themselves and their families by filling their homes with so much stuff. There is more to Annabelle's life than just what goes on at home. There's a boy at school named Drew who wants to hang out with her this summer. There are her friends who throw pool parties and sleepovers. There are all the things you can talk about with your friends and all the things you have to hold back...maybe even what books you like to read. Grandma Nora shows up and World War III commences. Will they get the house cleaned up in time for Dad to come back from his annual trip to Great Britain? When he comes back will he want to stay? This is a story of figuring out who you are, how you fit in and what it's like to live with mental illness. This is a story of how many things there are to find your way through when you're in middle school. As much as the stuff at home can squeeze the self right out of you, there are as many things in middle school life that threaten to do the same. 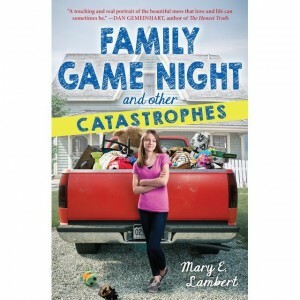 Friends, boys, phones, bikinis, technology, pottery classes and parents can be a catastrophe in their own right. This will be a tough, painful but validating book for any reader who has a hoarder in their life. It seemed to me there wasn't a very clear explanation made for young readers that something makes people begin to hoard. They don't just start doing it out of the blue and the reader won't either. It's not a disease that you catch. I did enjoy the hint of Rae's mother who probably has OCD... all kinds of people on the spectrum of normal and abnormal. It's important to bring these life situations out into the light for young people to recognize and understand. Are we doomed to grow up to be our parents? Authentic voices, difficult situations and relationships explored with care and honesty, middle school life angst and joys that will feel reassuringly familiar.